One of the ways in which Ismailis have expressed their identity wherever they have lived is through their places of prayer, known today as the Jamatkhana. Other Muslim communities give their religious buildings different names: from ribat and zawiyya to khanaqa. And, in addition, there are other places where Muslims of all interpretations can come together, such as non-denominational mosques. Bay‘ah is the spiritual contract or covenant that every Ismaili Muslim or murid has made with the Ismaili Imam of the Time. Bay‘ah gives the murid the right to access the Imam’s teachings, guidance, blessings, and spiritual medicine, and the Jamatkhanah is the private space where the Imam makes these available to his murids. The bay‘ah, a word which means “buying/selling”, is a two-way contract that includes a commitment from the murid and a commitment from the Imam. Thus, the bay‘ah between the murid and the Imam is a spiritual “transaction” or “contract” in which the murid commits his allegiance, devotion, and obedience (walayah) in exchange for the Imam’s spiritual guidance, intercession, blessings, and purification – in this world and in the afterlife. You perform bay‘ah, but you must first understand it’s meaning and then offer bay‘ah. When you offer me bay‘ah it means that you extend your hand to me with a promise…He who obeys me and promises to follow me after offering me bay‘ah I also give him my promise that I shall hold his hand in the Hereafter. The trials and tribulations of the Day of Judgment are very frightening and painful. I will keep him away from this. Since bay‘ah is a two-way contract involving both the murid and the Imam, only those who have given bay‘ah to the Imam of the time have access to private discursive spaces and private religious practices offered by the Imam in the Jamatkhanah, while those who do not give this bay‘ah are not privy to them. This only makes logical sense because every single Ismaili ritual practice performed in the Jamatkhanah is an expression and an enactment of the Imam-murid relationship, a relationship that only exists through bay‘ah. The act of bay‘ah indicates that a person accepts the Ismaili Imam as his or her spiritual master and guide and accordingly, only after this acceptance does it become appropriate to access the Imam’s guidance. It simply makes no sense for someone who has not given bay‘ah to participate in the Jamatkhanah practices. Accessing the Jamatkhanah practices without giving bay‘ah to the Imam is similar to walking into a store and stealing products without paying for them, or trying to access prescription drugs from the pharmacy without having the doctor’s prescription. It is incumbent upon the parents that they should first make their children my murid through the performance of bay‘ah…Those who have not offered bay‘ah they have not signed to accept our faith. Just as you sign on an agreement in your business and in other dealings, similarly, through bay‘ah, I take signature from your soul. 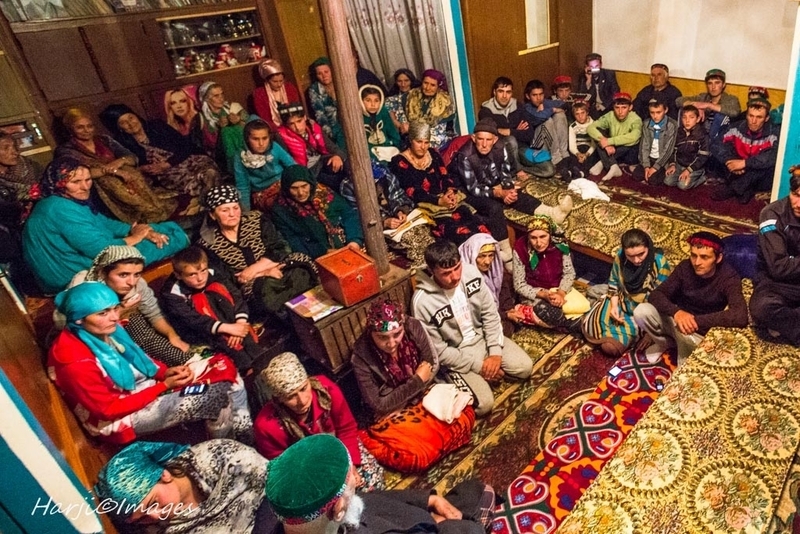 The custom of meeting in closed sessions, at specially designated places, to learn about and practice their own interpretations of faith, has been part of the Ismaili tradition from pre-Fatimid times. During the Fatimid period, the Ismailis used to participate in majalis al-hikma (sessions of wisdom), which were accessible only to those who had pledged their allegiance to the Imam-of-the-time. Naqshbandi sufis performing the bayah ritual. 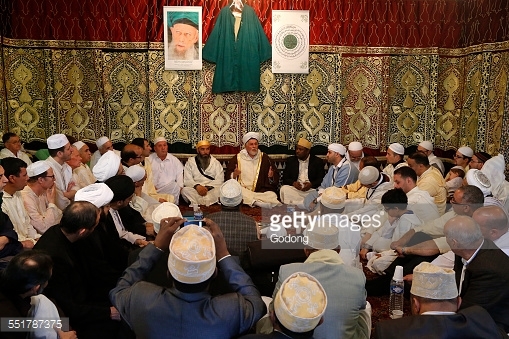 Urs of Mawlana Cheikh Muhammad Nazim Adil al-Haqqani in Lefke, Cyprus. Over the course of many centuries, Sufi tariqas (orders) have multiplied and spread all over the Muslim world, from North Africa to the Indian subcontinent. The spread of these tariqas was accompanied by the construction of specific spaces of gathering and their particular forms and expressions of rituals…Elaborate initiation rituals developed in which the disciple had to pronounce the bay‘ah (oath of allegiance) to the murshid and be invested with symbols of their entrance into the order (e.g., cloak, hat, etc.). As it was common for many Sufi shaykhs to be buried in their ‘place of residence’ (khanaqah), these spaces have become popular pilgrimage sites (ziyarat) to seek barakah and shafa‘a (intercession). Admission to such spaces is usually open to all, but this is not universally true. For instance, khanaqahs of the Suhrawardi Order in India are known to restrict participation to those who have given their bay‘ah, pledge of allegiance, to the pir or shaykh of the Sufi Order. With regard to the issue of the exclusivity of such spaces, Sunni jurists have viewed it to be a matter dependent on custom…Furthermore, in some European and American cities where Sufi tariqahs are emerging and growing, one can find similar institutions (such as zawiyah and khanaqah), often in private, where adherents meet regularly to perform acts of worship that closely resemble tariqah religious practices. The center of activities among the Chishtis was called the jama‘at khāna, literally “the house of gathering.” Unlike the khanqah of Iran and central Asia, which might often be a large establishment supported by endowments, the Chishti jama‘at khana was essentially the residence of the shaykh. Meals were taken there, people slept there, and the basic teaching activities, interviews, and rituals (including sama‘) also took place in central room of the jama‘at khana. Early Chishti masters such as Farid al-Din Ganj-I Shakkar insisted that this was the normal practice of association for the order…Farid al-Din Ganj-i Shakkar’s concept of jama‘at khana was that it be hidden from the people, a retreat rather than a showplace. Nizam al-Din Awliya also maintained a simple jama‘at khāna, and the same organization was followed by Burhan al-Din Gharib and Zayn al-Din Shirazi. The desire for privacy was probably the reason for the selection of Khuldabad, several miles away from the Daulatabad fort, as the site for Burhan al-Din Gharib’s jama‘at khana. The Sufi private spaces – the ribat, khanaqa, zawiya, etc. – and the Ismaili private space, the Jamatkhanah, are different from the institution of the mosque (masjid). A mosque is a nondenominational space that serves Muslims of the exoteric public domain known as the shari‘ah. Sufi and Ismaili prayer spaces are private denominational spaces and serve specific communities who participate in the esoteric domain of Islam known as tariqah – this is why Ismailism and the Sufi brotherhoods are called “tariqahs” today. Entrance into a tariqah is only by way of the bay‘ah (as explained above). 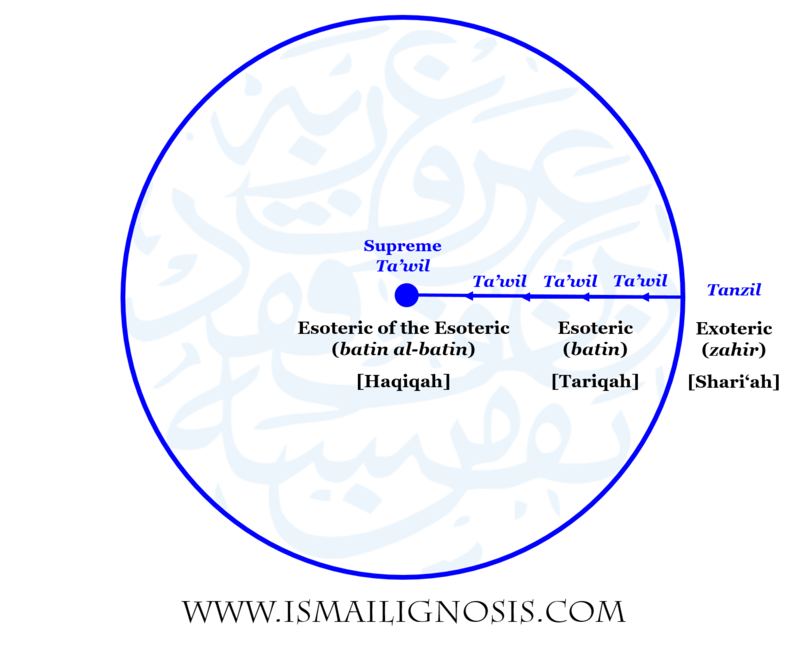 The Circumference of the Circle is the Shari’ah. The Radius is the Tariqah. The Centre is the Haqiqah. Tariqah is higher than Shari’ah, and Haqiqah is higher than Tariqah. The Tarîqah or Spiritual Path which is usually known as Tasawwuf or Sufism is the inner and esoteric dimension of Islam and like the Sharî`ah has its roots in the Quran and prophetic practice. Being the heart of the Islamic message it, like the physical heart, is hidden from external view, although again like the heart it is the inner source of life and the centre which coordinates inwardly the whole religious organism of Islam. The Tarîqah is the most subtle and difficult aspect of Islam to understand at the same time that its external effect is to be seen in many manifestations of Islamic society and civilisation. Those capable of higher truths should have available for them existential spaces where they can meet to discourse and transact and otherwise explore in terms of higher truth. The logic of Revelation necessitates, in other words, separate physical and social domains of public/Seen physical and social space and private/Unseen physical and social space as differentiated spaces for the social elaboration and operation of spatially-differentiated truths and meanings. It cannot be emphasized enough, however, that, as a space for discourse, what I am calling “private discursive space” is very much a social space—that is to say, it is a space not of individual secrecy, but rather a restricted collective space in which for people to gather in private society for discourse (and performance) of Truths not appropriate to unrestricted common and public space and society. As such, it is a sort-of public-private space, or a private-public space. It is, precisely, the communicative space of a more-or-less self-constituting class of persons who mutually recognize the capacity of their peers to entertain and deal with the communication and practice of complex, and often contradictory, exploratory truths. Thus the act of meaning-making is personal in that it is made in the individual self, public in that it is communicated to others, and private in that it is communicated to a limited and qualified public. This mutual recognition requires, of course, that there be something that makes people mutually recognizable. That something is, by and large, a shared education productive of shared attitudes to the nature of Truth. It is, in other words, “the whole intellectual and spiritual world revealed by education into which an individual is born” that makes the one person recognizable to the other as a partaker in the discourses and practices and meanings…When discourse and actions remain in the space of the private/high/khāṣṣ they are unaffected by the normative truths and values of ʿāmm/lower/public space—and are in that space governed by the normative truths and values of private/high/khāṣṣ space. O you who have believed, do not enter the houses of the Prophet except when you are permitted. O ye who believe! enter not houses other than your own, until ye have asked permission and saluted those in them: that is best for you, in order that ye may heed (what is seemly). In conclusion, while the non-denominational masjids or mosques are public places for the rituals of the shari‘ah such as the exoteric namaz (salah), the Ismaili Jamatkhanah is a private space reserved for the practices of the Ismaili Tariqah and therefore only accessible to murids who have given bay‘ah to the Imam. For many centuries, a prominent feature of the Muslim religious landscape has been the variety of spaces of gathering co-existing harmoniously with the masjid, which in itself has accommodated a range of diverse institutional spaces for educational, social and reflective purposes. Historically serving communities of different interpretations and spiritual affiliations, these spaces have retained their cultural nomenclatures and characteristics, from ribat and zawiyya to khanaqa and jamatkhana. The congregational space incorporated within the Ismaili Centre belongs to the historic category of jamatkhana, an institutional category that also serves a number of sister Sunni and Shia communities, in their respective contexts, in many parts of the world. Here, it will be space reserved for traditions and practices specific to the Shia Ismaili tariqah of Islam. According to Al Quran, Ayaat 36 tells us about some homes which Allah Subhanahuwa wa taala has exhalted where people Praise Allah in mornings and in evenings.When this Aayat was revieled Hadhrat Abu Bakar. Asked Huzur Pak. Is it the house of Ali Prophet SA said its one of thoses houses and given more respect. Its worth noting that here name house is mentioned not mosque. The Shia Imami Ismailis follow recite tasbeeh in such houses which are called, Jamaat Khana.If the three ayats are read ie 36, 37, 38. It gives a clear understanding. Where have u found that hadis? Read the context of the sura, where it is written about those who read three times, I doubt there are at least some supporting arguments to find jamaatkhana matching there. And what are the main differences between mosque and jamaatkhana, beside mistic things ? Jamaatkhana was called so long after the time you mentioned it was discussed, if I call my son Jesus will it be him that was predicted to come back in the end of.times. Think twice before interpreting Quron. I.believe it was about those who prayed three times even then, due to some issues . A masjid is a “place of prostration”. Jamatkhana is the “house” of the Imam of the Time. In the Qur’an, the house” (bayt) are distinguished and mentioned differently from masjids. I would like to know if the Ismailis are into the Exoteric practice of Islam like saying prayers (Namaz) at a common place of worship such as; Masjid? You have mentioned about the Sufi Tariqah, and the Sufis have always practised Shariah whether we speak about Mansour Hallaj, Rabia Basri or Rumi for that reason. There are many renowned Sufis who have followed the Shariah as well as the Tariqah and followed the ‘Zahir’ and the ‘Batin’ of the Qur’an. How would you explain that? I am interested to know? The Ismailis practice the batini form of the shari’ah acts of worship and not the zahiri form. This is as per the order and command of the Imam of the time. Ismailis are free to join other Muslims in masjids for namaz, but this is not obligatory on them. “Ismailis are free to join other Muslims in Masjids for Nimaz” Is this what you say or MHI has said in any speech or Farman? If this is so then whats the need to go to the Jamak Khana and doing Ismalili practices because I have heard the Farman “It is better to join other faith if you have duality in faith” Means either we must go to JK or Masjid but going two places is dangerious according to the Farman! You are misunderstanding. Ismailis are not restricted or prevented from joining other Muslims in namaz. Imam Sultan Muhammad Shah encourages Ismailis in Muslim majority countries to do this. However, this does NOT mean Ismailis should stop attending their own Jamatkhanas – not at all. Ismailis always have religious duties in the Jamatkhana. That never changes. 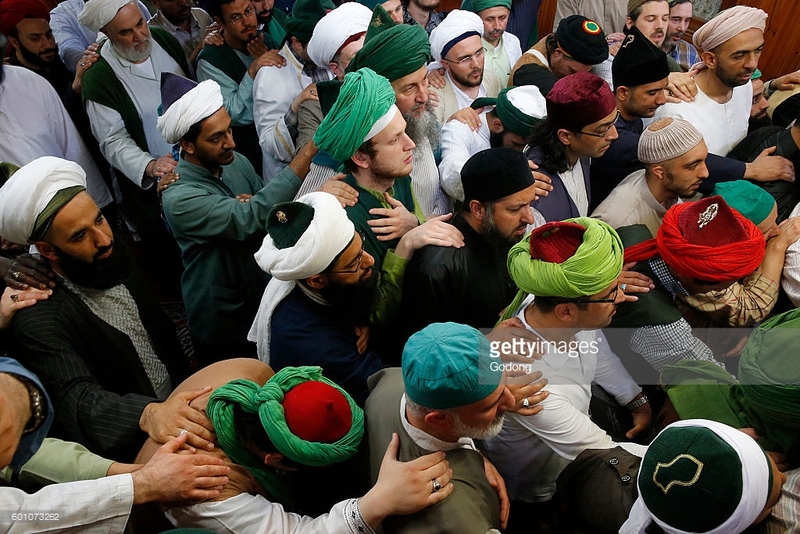 How does you proof the universality of the Imam (The Current Imam)? If the Imam is the Imam of the universe (as per consideration) then His religion or sect must be the universal one and if it is universal religion or the sect then its religious activities must be universal and if activities are universal then performing spaces (Jamatkhana) must be universal? As Imam Ali (AS) was and is the Imam of the Universe, thus this makes the Imam (Shah Karim) the imam of the universe! if it is so then why jamatkhana is a private space? The Imam is a universal figure: he gives guidance to all humanity in his speeches and interviews. However, the Imam has a special exclusive relationship with those who have given their bay’ah to him and made a promise to him. So the Imam gives special guidance and special blessings to those people – because he is bound to them by the bay’ah. The Jamatkhana is NOT a universal space, it is a Tariqah specific place. There are different types and levels of prayer spaces in Islam: some spaces are public and others are private. Jamatkhana is one of the private spaces. There is no rule in Islam that says EVERYTHING must be universal and public – this is not true historically given that Muslims have gathered in numerous PRIVATE spaces like khanaqa, zawiya, ribat, Sufi shrines, tekke, Imambargah’s, dargahs, etc. Jamatkhana is a private space and there is nothing to be ashamed of about this and Ismailis have gathered in private spaces since the beginning. why do ismaili ask for help from their imam whereas it is ignorance why not from Allah??? Hazrat Ali used to ask for help from Allah but why Ismaili do this?? Is it not shirk??? While I agree wholeheartedly that participation in jamat khana ceremonies should be restricted to people who are members of the Ismaili faith (i.e. who performed Baiyat with the Imam), I do not see why a non-Ismaili would not be allowed entrance into a jamatkhana during the prayer time to observe the ceremonies. If I was a non-Ismaili interested in learning more about the Ismaili faith, perhaps just out of curiosity, or perhaps because I was genuinely interested in joining the faith, I would want to actually observe the practice of the faith first hand rather than just reading about it or having someone give me an education on its practices. There is a difference in PARTICIPATION and OBSERVATION. You cannot go into a golf club and play golf unless you were a member of the club. That of course is perfectly correct, that you cannot participate in a club’s activities unless you become a member of that club. However, you can always enter a golf call to sit in the stands and observe the players playing golf. If i was a non-Ismaili and asked for permission to enter the jamatkhana during prayer times to simply sit and observe the ceremonies in order to learn about the faith, would I be granted permission? i suspect the answer would be no. Sorry, but I don’t agree with that at all. Also, as an Ismaili myself, I have to say that in my personal opinion, I have found the practice of our faith in the jamatkhana far removed from any esoteric nature as such. The Jamatkhana has become a place where rituals are conducted and most Ismailis blindly follow the rituals. Most of them do not even understand what the rituals mean. In the esoteric, you worship Allah and not the messenger. Unfortunately, the jamatkhana rituals seem to emphasize the Imam rather than Allah. Hence, the jamatkhana practices are probably more closer to a “Shariah” brand of religion than to the “esoteric”. This is my personal opinion only. The entire jamatkhana prayer hall is INCLUDED in the Tariqah rituals and ceremonies – even when 2nd Dua ends and people get up to do Ghat Pat, Dua Karavi, there is still a ceremony going on. The ceremony ends after the final Dua Niyyat Khayr Dua by the MK. There is no distinction between presence and participation. If the purpose of someone is to learn, then Jamatkhana is not the right venue. You don’t learn about a Tariqah by observing it; you learn about it by reading about its principles from books. The Jamatkhana space and ritual ASSUMES every participant already committed to the Imam and has requisite knowledge to be there. You final point – that Ismaili rituals are closer to shariah and not esotericism is not factually accurate both in terms of theology and history. The shariah worship – like namaz for example – is only focused on God (read the translation of namaz performed in mosques). But esoteric rituals in all of Islam – including Sufism – focuses on how God is truly approached through the Prophet Muhammad, the Ahl al-Bayt and the saints. All Sufi rituals invoke the intercession, tawassul, and dhikr of Muhammad and the Sufi saints. The entire Ismaili faith today is called Tariqah and not Shariah because all Ismaili rituals – with the exception of funeral rituals like namaz-i mayat – are esoteric Tariqah practice and not Shariah practice. Non-Ismailis and even non-Muslims can attend Shariah practices like funerals, burials, and namaz; but they cannot attend Tariqah practices. What Twelver and Sunni Muslims do in masjids is Shariah practice – this is a historical fact – and what Sufis and Ismailis do in Jamatkhanas and similar spaces is Tariqah practice. For some reason, you are claiming that the reverse is true – but your claim does not hold up against actual historical facts. Thank you for the detailed post on the Jamatkhaana. As a Sunni, I am interested in knowing more about the place’s significance in Ismailism. What sort of rituals take place inside the Jamaatkhaana? 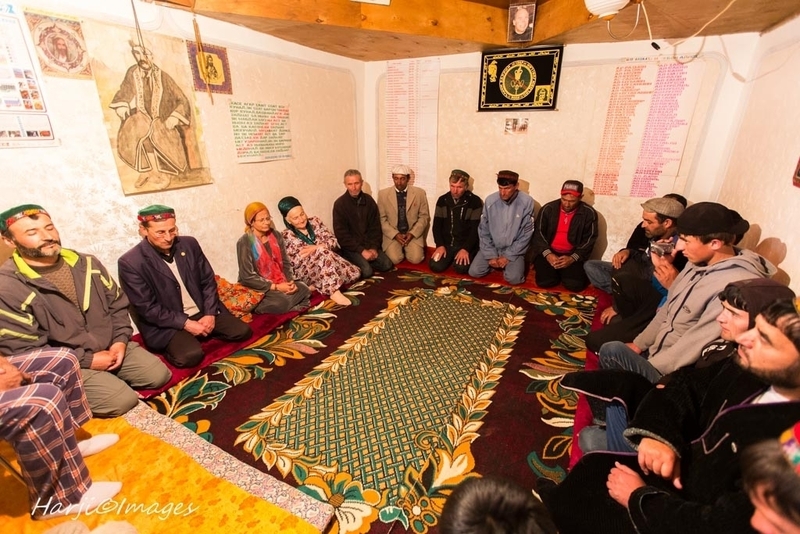 Are all Ismailis required to attend these rituals? Why don’t Ismailis normally offer salah in masjids alongside other Muslims? Can a sunni muslim convert into ismailis? Like in other Mathhabs of Islam the doors are open for anyone who wishes to accept Ismailism. The only thing should be beared in mind that first you will study its principles than will dicide for yourself does it fit what you are seraching for or not, after that you will write a letter to Agakhan to accept you as his Murid. Than you will bayah with him . Only then you will be as an Ismaili. Otherwise Being just Muslim is also OK. In Ismailism there isn’t the notion of excluding other mathhabs of Islam and considering them as Kafirs. We should respect each other and be the truly Umma of our beloved Prophet Muhammad (S). Assalamu alaykum.